Joshua Schachter is best known as the creator of Delicious . But a few years after he sold it to Yahoo in 2005, he left the company and joined Google. Since then, he’s been known to speak his mind about Delicious’ overall direction (which he doesn’t seem to like ), and it’s pretty clear that he still has the desire to create. And that’s exactly what he did tonight, quietly launching a new service he’s developed called a tiny thread . The idea is simple, take tweets and thread them together to form conversations, adding context. This works by using the a tiny thread site to both start new conversation threads, and add your comments to old ones. After authenticating via OAuth, your comment is then sent back to Twitter, with a link back to the a tiny thread conversation page. The site’s look is sparse (not entirely unlike early Delicious), but it’s very easy to follow conversations. You can see a good example thread here . Right now, the threads only go one level deep, so it actually very much resembles a FriendFeed comment section. FriendFeed, was of course just bought today by Facebook, and its future is uncertain. Other sites have attempted to thread tweets together in the past, but the results vary because of things like retweets that either break threads or add too much noise. Right now, it appears you can only add to these a tiny thread conversations on the site itself, so it works pretty well. But when you send the tweet back to Twitter, it just reads, “I joined a thread: is this thing on?” followed by a link to a tiny thread. It might be more interesting if it said what you actually said in the thread, enticing people to click on the link to read the full context. It would seem that Schachter, who has been tweeting out links to this for about the past hour or so, did this on his own time, rather than his Google 20% time. Again, it’s extremely simple, but kind of interesting — especially in a post-FriendFeed acquisition world. If you’ve been using TweetDeck without a dual-display setup, it’s just about time for you to make a purchase. With newly-announced support for Facebook, you’re going to need some more real estate. The release comes two short days after Twhirl frontman Loic Le Meur announced that Seesmic had released a standalone Facebook app which, like TweetDeck, is built on Adobe Air. Setup involves logging in to Facebook and the usual two or three clicks afterwards. Once completed, you’ll have a new panel showing your Facebook friends’ updates and a checkbox next to the update field to enable posting to Facebook. Curiously, TweetDeck includes the ability to email or tweet Facebook updates, something which doesn’t necessarily jive with Facebook’s TOS. For now, that’s about it for functionality. You can’t, for example, send replies. With TweetDeck’s history of Twitter kung-fu there will likely be plenty of enhancements in the coming months. To paraphrase Cracker, what the world needs now is another web-based Interactive micro-content production community like I need a hole in the head. But strangely enough, I think the world needs Blellow. Blellow is a fascinating collaboration tool a la Yammer but Blellow allows you to create groups based on projects – WordPress Devs can group with other WordPress Devs while freelance writers can kvetch with other writers, for example. To use the system you log-in and fill out a profile. Then you send messages – and ask questions – just like you would in Twitter or Yelp. The questions are actually the coolest part of the system. When you ask a question, everyone can see it and respond. You then thank folks who help you with Kudos and those users ride to the top of the heap in the system, thereby allowing potential employers to find the local experts in particular topics. You can join groups of like-minded individual, create private groups, and ask questions of your friends. You can also post jobs and paid projects for $24, which is where Blellow expects to make their cash. They’re also offering 10GB of storage space for $10 a month and the system accepts files of any size – up to your paid limit – to share with your peers. 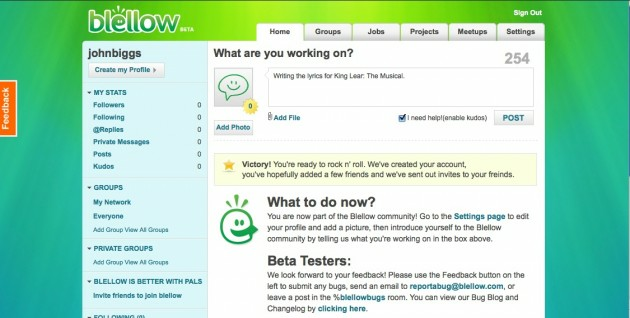 Just as Yammer is Twitter for business, Blellow seems to be Twitter for freelancers. But do we really need another Twitter? Sure, it’s a big world. In this economy, the little guy can use all the help he or she can get. Plenty of swirl this week about the Suggested Users page that Twitter newcomers see after sign-up. Jason Calacanis (co-founder of Weblogs, Inc., which publishes Download Squad) made a splashy offer of $250,000 to be installed near the top of the suggested list for two years. Dave Winer refuted that ploy, and the list generally. But Winer’s complaint with Twitter’s list misses the mark. Suggested Users is meant to be a starter kit for new Twitter users. It is well-meaning but misguided, and surprisingly, seems to misunderstand and misrepresent what Twitter really is. Dave Winer’s complaint is that Twitter is misusing its network power by applying editorial discretion to single out a tiny handful of its users. But in my view, Twitter is exercising the same sort of newbie service that My Yahoo! and Google Reader do: give unsteady new users a toehold by recommending some content. There is no problem in principle with Twitter lending users a helping hand as new consumers of Twitter content. The issue with Suggested Users is that it shines the discovery spotlight in the wrong direction, ignoring Twitter’s rapidly manifesting future as a global information matrix. Currently, Twitter recommends leaping in by friending people — following recommended feeds. Twitter suggests a mix of: 1) quirky individuals, 2) Twitter accounts affiliated with A-list blogs, and 3) tweeting celebrities. The service is trying to assist the unmotivated newcomer, by which I mean someone who joins out of general Twitter curiosity, not because they want to follow offline friends in an online space. You don’t want to point that person to the personal feeds of strangers. Twitter also shouldn’t become an A-list blog recommendation service. And while tweeting celebrities might seem to offer entertainment value, I can say that in many cases the reality is painfully disappointing. The best way to lock in an unmotivated newcomer with quick, exciting value, is to teach that person how to search. Rather than picking needles out of haystacks, reveal the vast scope of the Twitterverse. Give a man a fish you feed him once; teach him to fish, etc..
Twitter need never lose its legacy purpose of intersecting friends around the question “What are you doing now?” But its larger destiny is to be the new Google. Users who don’t already have Twitter friends could benefit hugely from a brief, clear tutorial on Twitter Search, and a focus on a new question: “What is the world talking about now?” When you dive in from that angle, you find your own organic points of attraction, and the foolish Suggested Users list recedes into the irrelevant background. On the flip side, Twitter publishers get an organic audience, unpolluted by an artificially inflated followers list. Jason Calacanis’ offer to buy a spot in Suggested Users is being interpreted as a prospective business model for revenue-free Twitter. But Twitter’s business future should match its true strength, which is the developing critical mass of its global mob. Twitter is already faster, more precise, and smarter than Google Search. The advantage will only widen. The most evident business future lies in search advertising. Everybody should be searching Twitter, either through its portal search tool or one of the third-party sites. And without question, all those newcomers being unnaturally shoved into stranger feeds should be taught to search instead. 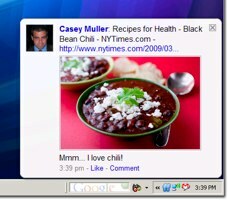 Not using a desktop Twitter client? Maybe you’re quite happy to use the Twitter site to post updates and monitor those you follow. Just because you do doesn’t mean you don’t have access to more powerful interface options than the bare minimum Twitter provides. Grab some Userscripts, and use your browser give your Twiter / Home some handy new features! I’ve gathered eight of my favorites – feel free to share yours in the comments! Troy’s Twitter Script – provides several additional functions, like short URL expansion, inline media viewing, and nested replies. Also adds a search box (for those of us who can’t use the real deal just yet), retweet link, and an @mentions link to see who’s been talking about you. Twitter Friends Name Helper – adds a handy autocomplete ability to the update box. Start typing a friend’s name (no @ sign required) and a dropdown appears from which you can choose a name. If only one match is found, Name Helper will instantly insert it. Twitter Saviour – blocks tweets that contain text you don’t want to see. Use it to filter (gasp!) inappropriate cursing or annoying fluff you can do without, like comments about the Jonas Bothers (typo?). There’s also Hashtag Ignore, which you can use to block specific tags. Would be more useful if more people used hashtags. Display Popular Trends – adds a handy list of the current top ten keywords and hashtags to the Twitter sidebar. Twitter URL Shortener – some URLS push your update input beyond 140 characters, at which point Twitter won’t let you submit. This script takes care of things by automatically squeezing any URL in the box. Universal Post Bar / AddThis Anywhere – These both provide the same function, adding a small, clickable social sharing menu to every page you visit. Click to open the menu, then click where you want to send it – Twitter, for example. My only gripe was with their lack of URL-shortening kung fu, but the previous script takes care of that anyway. Sometimes it seems that we’re so plugged in to Twitter here @downloadsquad — rather, at Download Squad — that we don’t even know FriendFeed exists. Not true! In fact, I noticed that FriendFeed just released an official desktop notifier, built on Adobe AIR. It’s pretty rough so far, but a lot of users are commenting with feature requests and improvements. The main issue people have with the notifier so far is that it’s a bit overwhelming. Right now, it just displays a pop-up for every new item in your feed. Useful, sure, but that can be a lot of items. Without customization settings to narrow down what you’re seeing — or slim down the size of the pop-up — it’s very obtrusive. You also have to click through to take certain actions (like responding to comments) in a browser window, even though it looks like you should be able to do it right in the notifier. Despite these little annoyances, the desktop notifier is a good first step, and seems likely to improve in the near future. 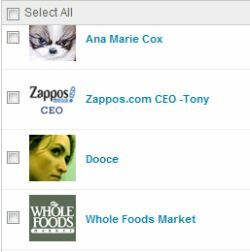 Search Cloudlet is a plugin for Firefox that adds relevant tag clouds to searches you conduct using Yahoo! or Google. We first looked at the program a few months ago and were impressed with the way it helps refine your searches. You can also filter your results by clicking ont he Authors, @To, or #Tags buttons. Or if you’d rather not see the tag cloud at all, just hit the Off button. If you’re signed up to get email when someone new follows you on Twitter, you’re probably used to seeing just the tiniest bit of information about them. With only a person’s name and Twitter URL, you’re forced to click through and change focus from your email to Twitter if you want to know more. 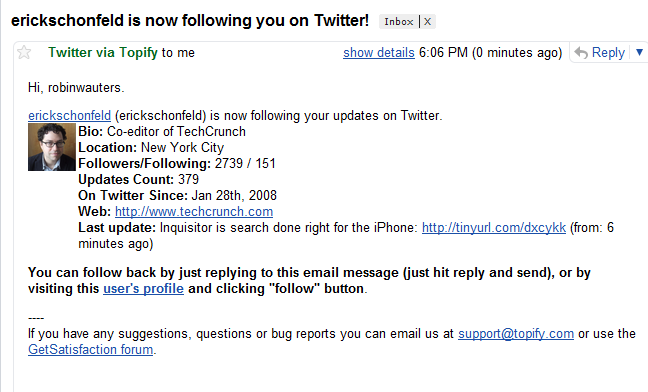 Twimailer uses a neat workaround to replace Twitter’s new follower emails with its own better version. It generates a unique Twimailer email address that you then paste in as the address for your Twitter account. 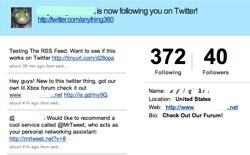 New follower emails go through Twimailer, which adds the new follower’s latest few tweets, follower/followed count, Twitter bio, and a button to follow back. These replacement messages are both more visually appealing and more informative than the originals. Although you don’t have to give your password, your email from Twitter is routed through Twimailer. I have no reason not to trust them, but I turned off direct message emails anyway. Tech news aggregator TechFuga has some new features this morning, including a new news clustering algorithm, easier-to-read graphics, more news sources, and better news search. The one feature I really like is that it now searches Twitter, in addition to all of the news sources it keeps track of. For instance, here is a search for “Greystripe,” which had some funding news earlier today. Our post shows up, but above it appears all of the Twitter chatter about the news as well. Notice that the Twitter results appear above the blog post results. But nevertheless, you get a unified view of what people are saying about this particular topic. 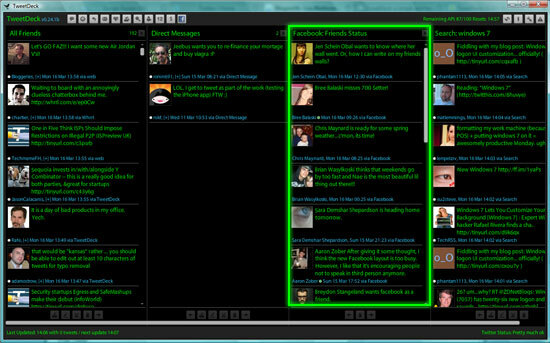 TechFuga’s overall layout is a mixture of Techmeme and Alltop. The big headlines of the day are clustered above the fold much like on Techmeme. In fact, you will find most of the same stories on Techmeme. Where TechFuga begins to differentiate itself is with a column of developing news on the right, and tabs along the top which let you view more top news, latest news, and upcoming news. If you go below the fold on the homepage, you are presented with an Alltop-style view of the last eight headlines from each of TechFuga’s top news sources, which include mostly other news aggregators such as Techmeme, Hacker News, Digg, Google News, BlogRunner, and Yahoo Buzz. Many iPhone developers have horror stories about their apps being rejected from the iTunes App Store for frustrating, sometimes arbitrary reasons. After today, Atebits, makers of the bestselling iPhone Twitter client, Tweetie, might take the prize for the most absurd rejection yet. 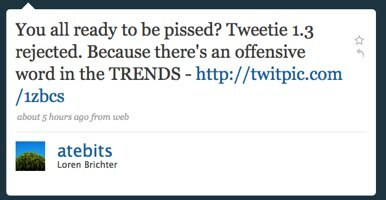 Tweetie 1.3 was barred from the App Store for offensive language. Seems fair enough, until you realize that the swear in question wasn’t part of the app, it was just a hashtag that happened to be trending on Twitter and got picked up by Tweetie’s trends feature. Most of the competing iPhone Twitter apps also have trends, and would have been just as “offensive” if they had run into the bad luck of being tested while something Apple didn’t like was popular. The Atebits Twitter account has been equal parts frustrated and practical in commenting on the rejection. I think the idea of sending screenshots of trends in other Twitter apps to Apple, hashtag cussing included, is brilliant. Update: Tweetie 1.3 has now been accepted into the app store, and the developers don’t seem to have any hard feelings toward Apple. I hope this case highlights the need to continue improving the app store submission process. Twitter Search is great at tracking trends, but you have to refresh your search page manually when new results appear. 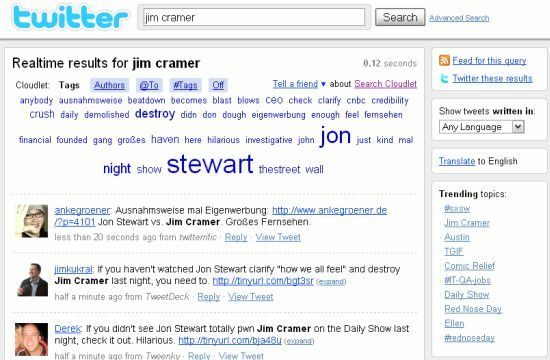 Twitterfall solves that problem by cascading tweets with popular keywords or your custom search down the page in real time. 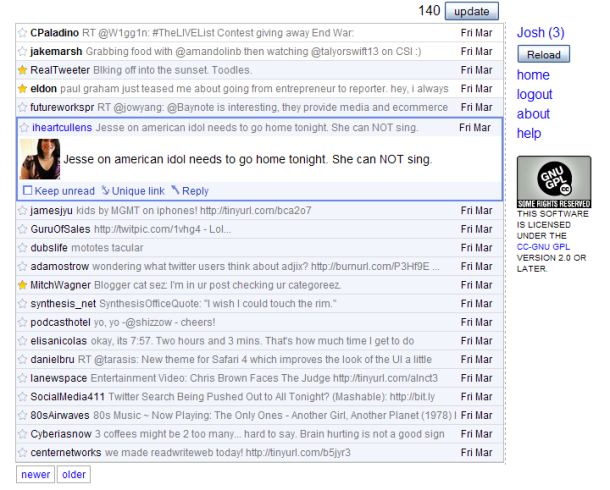 You can also log into Twitter to put your friends’ tweets in the mix, or just view them by themselves. The customization available in Twitterfall is impressive. Both the appearance and the content can be adjusted, with a couple of different skins and plenty of search options. You can filter out retweets, specify a geographic location to search, and more or less make Twitterfall show you only exactly what you’re looking for. You can also tweet, favorite, dm, reply and retweet from it, if you’re logged in. This could easily replace the Twitter web interface in some people’s bookmarks. Everyone’s Twitter habits are different. Some people check the site once a day via the web, some people check it every 3 minutes using a Twitter client. If neither of those appeal to you, because you’d rather not have a separate app or even a separate tab open to view your friends’ recent updates,Tweetpkr might be for you. It’s a browser bookmarklet that loads your Twitter list in a sidebar on the page you currently have open. The ability to check Twitter with one click, without changing focus, is more useful than it sounds at first. Each time you close and reopen Tweetpkr, it refreshes your list. That means no more jumping between tabs and hitting refresh, or winding up with a half-dozen Twitter tabs open. Privacy-conscious twitterers will also appreciate that Tweetpkr stores your username and password locally with the bookmarklet, not on its server. Oh, and multiple accounts are supported: just make a separate bookmarklet for each one. Google TipJar : nice idea, but too much self-promotion? There’s been a fair amount of buzz over the past couple days regarding TipJar, a place to share money-saving advice powered by Google Moderator. It started with a Tweet from the official @google account, which nearly warranted an immediate post from us, but we let it sit for a couple of reasons. The biggest one: ambiguity. 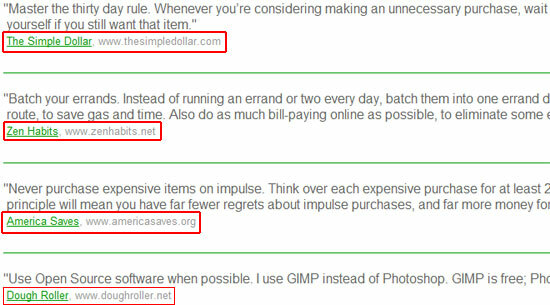 Twitter has been flooded with tweets about TipJar, saying it’s like “Digg for money saving ideas.” Take a look yourself, though, and see if you notice what we did: most of the tips are left by other money-saving websites. While it’s not something to be blamed on Google, the end result looks like a flood of shameless self-promotion, regardless of how useful the tips are. To Google’s credit, there are no links that can be clicked to visit the URLs that tipsters leave. It’s bit disappointing, but this is what we’ve come to expect on the web. If there’s a good, new service available somewhere, you can bet that it won’t take long for opportunists to use it as a way to drive traffic back to their own sites. Content and questions aside, TipJar is a nice showcase for Moderator and we will no doubt see more applications build on its foundation. Hopefully they won’t all wind up as a dumping ground for shameless plugs. My Webware colleague Don Reisinger would get a kick out of TwitteReader, a new and free service which turns Twitter into something resembling Google Reader (something he’s ditched entirely in place of Twitter). Once you’ve plugged in your username and password, it presents the latest tweets as individual feed items, which you can cruise through either by reading the short snippets (a la Google Reader) or expanding them out to full posts with a click. Just like Google Reader and Gmail, you can move up and down the list with the same J and K keyboard shortcuts. You can also star items, which adds them to your Twitter favorites list. The application keeps track of what you’ve read and what you haven’t, which, depending on how many people you’re following, could be useful. If a system like Google Reader’s trends were to be applied to this you could see which people’s updates you’re not reading and cut them out of your followers list. Of course the obvious must be stated here–you can simply take the RSS feed of your friends provided by Twitter and plug it into Google Reader to accomplish something quite similar. TwitteReader’s killer feature, however, is that it lets you post and reply to messages from each post, just like you would in Twitter. Twitter To Start Serving Local News To Users? Germany’s Der Spiegel published an interview with Twitter CEO Evan Williams yesterday on its website, and Williams had a couple of interesting things to say. You can find a poorly Google-translated version of the interview here, which features Williams answering the usual, boring questions ‘professional’ journalists tend to ask about the micro-sharing service (the reporter opened the interview with the Pulitzer-prize caliber question “so does Twitter spark narcissism and idiocy?”). But Williams did share something worth noting at the end of the interview. When asked about possible future features for Twitter, he reportedly said that one of the things being considered is an extension that lets people know what’s happening in their immediate vicinity. That would basically mean that Twitter could actively ping users about local events that are going on in their neighborhood, in real-time, based on the location they’ve indicated. As an example, Williams says users could be alerted to the fact a fire is burning a few streets away from where Twitter knows (or thinks) they are. It’s not clear if this feature is under development or merely in the idea stage right now, but rarely does anyone from Twitter give so much insight into the startup’s plans for the future in terms of product features, so we’re inclined to believe it’s coming sooner rather than later. Some questions arise. How frequently would Twitter ping users on local news? In what form (replies, direct messages, SMS, …)? How personalized would this be (what constitutes news for you may not mean the same to your neighbor)? And if it’s only about alerting people in case of emergencies, like the example Williams cites, who would be the one to determine when and why it’s worth sending warning messages out to users? Would they be possibly opening such a feature up to the authorities (police, fire fighters, etc.) so they could be the ones alerting users about potential risks in their vicinity themselves? Last but not least, could this be an indication of their impending revenue model? If you think about it, location-based marketing messages would fit right into all of the above, for better or worse. If you are not a Twitter power user, you can ignore this post. But if you find yourself increasingly relying on Twitter and spending way too much time managing your followers, trying to figure out who they are, or responding to their private direct messages, you’ll want to try out Topify Created by former TechCrunch France editor Ouriel Ohayon and Arik Fraimovich as a tool they needed for themselves, Topify lets users manage their followers and respond to direct messages directly from their email inbox. Topify is essentially a time saver. Once you set it up (we have 200 invites for TechCrunch readers) by replacing your email in Twitter’s settings with one that Topify provides which redirects back to yours, you get an email every time someone follows you. The email contains a snapshot of that person’s Twitter activity: a one line bio, location, number of followers and followees, Twitter update count, Twitter tenure, and last Tweet (see image). It basically tries to gives you enough information to decide whether you want to follow that person back, which you can do simply by replying to the email. Topify also lets you reply to direct messages (Twitter’s version of private messages) by replaying directly via email. This saves you the step of having to go back to Twitter and login before responding. These are all basic features which should be part of Twitter, but until then you can use Topify. For public replies to your Twitter messages, you don’t get an email (because Twitter itself does not offer such notifications). Adding @replies might flood your email inbox, but I actually would prefer getting those as well because I find myself often missing replies and not responding until days later, if at all. As Twitter grows and more people come on board, this tool is especially useful during its viral phase, when the number of followers any individual is accumulating on a daily or weekly basis should be accelerating. 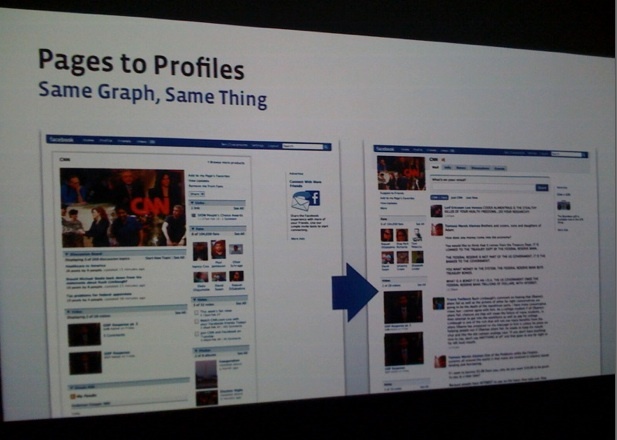 One of the biggest changes is that Facebook is getting rid of the distinction between private profiles and public pages. The 5,000-friend limit will be dropped from the public pages. Facebook doesn’t want Twitter to become the way large companies and public figures connect to fans. Up until now, Facebook Pages haven’t really been the place fans go to connect with their favorite celebrities or brands. For that, they’ve started going to Twitter, where they can get updates in real time. What we’re talking about today, is that there’s a philosophical change in that we want to converge these public figures (which are one way) and friends (two way connections). The stream is what is happening. 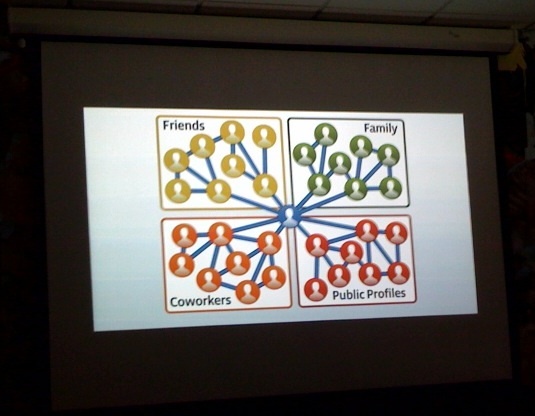 We think it is as core as the graph. The graph is the connections, the stream is what is happening. With the new homepage, that will reflect a much faster flow of information. 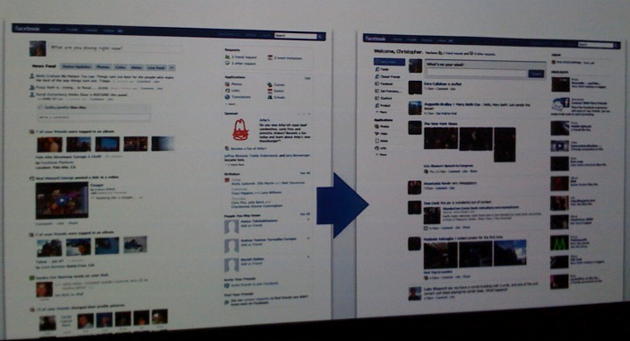 The redesigned homepage will allow users to sort through and filter their feed more easily. 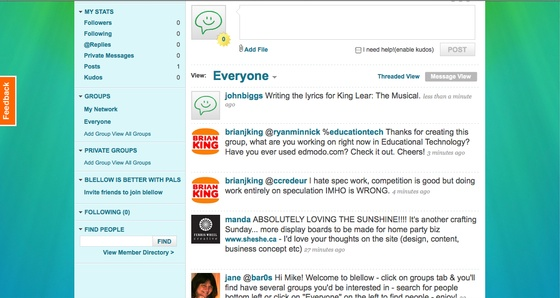 Updates will be able to be filtered by groups, specific friends, family, or by applications. A new publishing box for sharing updates will incorporate the ability to add not just status notes, but also links, photos, and videos. A new widget will highlight items from friends and other connections members interact with the most. In this way, Facebook is trying to strike a balance between its traditional strength as a private communication system and the increasingly public connections being made on the service as well. On the surface these may seem like evolutionary changes, but the stakes are high. Facebook is trying to shore itself up as the foundation for a living, rapid-fire Web where the line between private messages and public content is blurred. Under no cisrcumstances does it want to cede the thought stream of its users to Twitter. 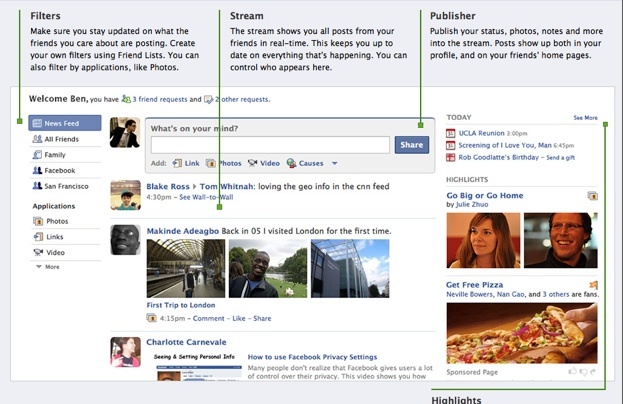 Instead of asking, “What are you doing right now?”, the new status update box asks, “What’s on your mind?” Mix in Facebook Connect, and these thought streams can be collected from all over the Web. Despite its already considerable size, Facebook is showing how adept it can be in responding to new threats. If Facebook cannot buy Twitter, it will try to beat it instead. At a dinner tonight with a friend the conversation turned to Twitter. He just didn’t get it, and he’s certainly not the first person to tell me that. Specifically, my friend didn’t understand the massive valuation ($250 million or more) that Twitter won in its recent funding. I told him why I thought it was more than justified: Twitter is, more than anything, a search engine. I told him what I thought of Twitter as a micro-blogging service: it’s a collection of emotional grunts. But it’s wonderful nonetheless. And enough people are hooked on it that Twitter has reached critical mass. If something big is going on in the world, you can get information about it from Twitter. Twitter also gathers other information, like people’s experiences with products and services as they interact with them. A couple of months ago, for example, I was stuck in the airport and received extremely poor service from Lufthansa. I twittered my displeasure, which made me feel better – at least I was doing something besides wait in an endless line. I’ve also Twittered complaints about the W Hotel (no Internet, cold room) and Comcast (the usual Internet gripes). 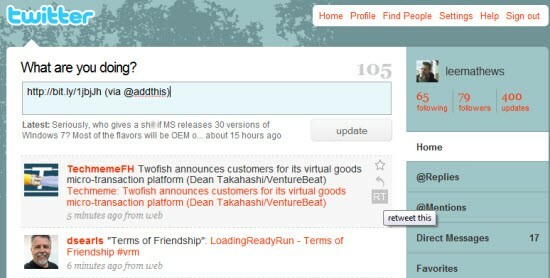 More and more people are starting to use Twitter to talk about brands in real time as they interact with them. And those brands want to know all about it, whether to respond individually (The W Hotel pestered me until I told them to just leave me alone), or simply gather the information to see what they’re doing right and what they’re doing wrong. And all of it is discoverable at search.twitter.com, the search engine that Twitter acquired last summer. People searching for news. Brands searching for feedback. That’s valuable stuff. Twitter knows it, too. They’re going to build their business model on it. Forget small time payments from users for pro accounts and other features, all they have to do is keep growing the base and gather more and more of those emotional grunts. In aggregate it’s extremely valuable. And as Google has shown, search is vastly monetizable – somewhere around 40% of all online advertising revenue goes to ads on search listings today. And as John Battelle says, its not clear that Google or anyone else can compete with Twitter at this point (Facebook’s giving it a solid try, though). And it’s not just ads that can bring in the money. Brands need tools to make sense of all this data that Twitter doesn’t yet supply. Third parties like Scout Labs are going to be mining this data themselves, I’m sure. But there are lots of other ways Twitter can tax the utility they are bringing to brands. If they manage to turn down the acquisition offers like Facebook did a couple of years ago, there’s no reason Twitter can’t find revenue streams that will support them as a standalone company. Possibly even a public one. 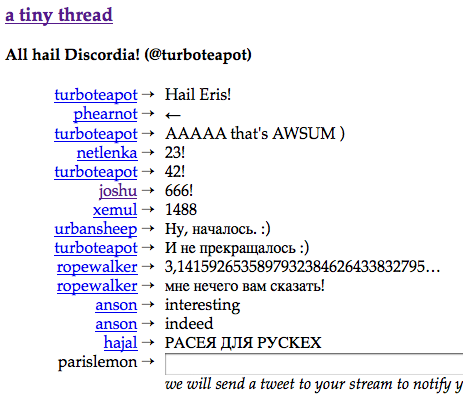 Follow @TwitBrain and get served calculations on a regular basis (like 3 per hour). If you’re the first person to reply with the correct answer, you’ll earn one point and hopefully make your way to Internet fame (well, not really) by getting on the top 10 lists. Follow @BeatMyTweet and do the exact same thing, but this time with word scrambles. Warning: it’s ridiculously easy so be fast if you want to be one of the first 10 to reply with the correct answer. Leaderboards here. Update: check out Twoof and @Twitoku too!